The Worcester Railers made the hour trip north to Manchester to take on the Monarchs at SHNU Arena Saturday night looking to put their disappointing loss Friday night against Maine behind them and to once again jump back into one of the top four spots in the ECHL’s North Division. As has happened far too frequently this season the Railers came out of the gate flat, and against a team like Manchester that almost always comes out firing on all cylinders that’s a recipe for falling behind early. Worcester did manage to hold off the Monarchs for a little bit, but when Tony Cameranesi was able to throw a backhand pass from the right wing corner to Nic Pierog steaking to the net the Railers were down 1-0 when Pierog flipped a backhand shot over Worcester netminder Mitch Gillam and in at 10:39. It was Pierog’s fifth goal against the Railers in his last four periods played against them. In the second period play was a bit more even but the Monarchs would again strike to take a two goals lead. After Worcester had a great chance to tie the game Manchester played some nice transitional hockey to get the puck into the offensive zone. Matheson Iacopelli then won a puck battle at the left wing half boards and threw a tape to tape cross zone pass to Daniil Miromanov all alone heading to the far post. All Miromanov had to do was tap it in and it was 2-0 Manchester at 16:17. The Railers would grab their only goal of the game with some transitional play of their own. Connor Doherty picked off a Monarchs pass at the center red dot and fed the puck over to Bo Brauer on the left wing side. Doherty got a piece if Brauer’s shot but Manchester netminder Charles Williams made the save. The rebound when right to the stick of newcomer Drew Callin, and the Bentley University alum buried it for his first pro goal in his first pro game at 18:40. But that was as close as Worcester would get as Miromanov grabbed his second marker of the game at 15:11 of the third period when he was left all alone in front of the Railers net to make it 3-1. Pierre-Luc Mercier added a late empty net goal for the 4-1 final. The Railers take on the Reading Royals on Sunday with a 4pm puck drop. They return to the DCU Center next weekend with a pair of game against the Brampton Beast on Saturday and Sunday. Scratches for the Railers were are Evan Buitenhuis (Day to day/lower body), Tommy Kelley, Kyle McKenzie (14-day IR/season), Ross Olsson, Tommy Panico (14-day IR/season), and Alex Vanier (14-day IR/upper). Blake Wojtala was the back-up netminder. This weekend this schedule doesn’t work in Worcester’s favor. 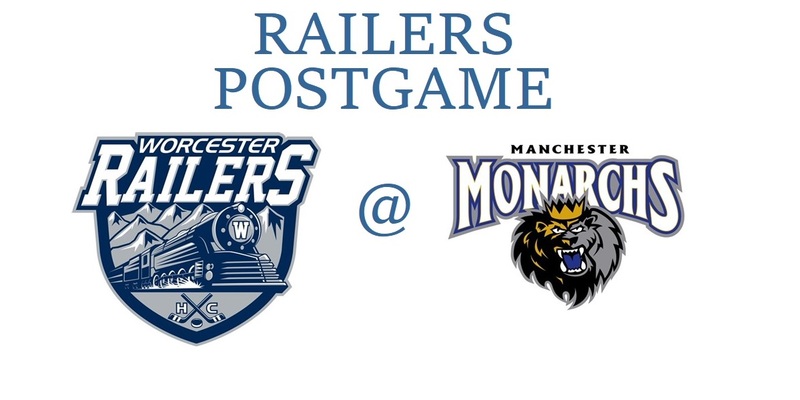 For the second time in as many meetings the Railers faced a rested Monarchs team as Manchester had Friday night off while Worcester played at the DCU Center against Maine. Last weekend it was the same, with the Railers playing Maine in Worcester Saturday night while the Monarchs had the night off before their contest on Sunday. As soon as Saturday’s game with Manchester was over the Railers jumped on the bus for a mad dash for their Sunday afternoon game in Reading, Pennsylvania against the Royals. If all goes well that bus trip will take about six hours, with Worcester arriving about 4am with puck drop scheduled for 4pm. This writer understands the economics of it, but the ECHL should be a little embarrassed that they make their teams wear these terrible Nickelodeon jerseys. It was Manchester’s turn Saturday night, and while their Teenage Mutant Ninja Turtles were different than the ones the Railers wore recently they were still awful looking. Now contrast that jersey with the Cancer Awareness Jerseys the Reading Royals wore last night. If the goal of the ECHL and Nickelodeon was to make the jerseys as ugly as possible, they nailed it. Unless Manchester and Worcester meet in the playoffs this could be the Railers last trip to the Granite State for a while. Currently the Monarchs are for sale and there’s been no whispers on or off the record from anyone connected to the team about what the franchise’s plans are for next season. They are still selling season ticket packages for the 2019-20 season, but many teams in the ECHL and AHL have done that in the past and still not played the following season. The attendance for Saturday night was listed at 4,102 and it was considered a good crowd for them. In their heyday years in the AHL that number would have been have been bad for a snowy Wednesday night. Time will tell if we’ve seen the last of this incarnation of the Monarchs. On this day, March 24th, in Worcester hockey history…in 1996 Fred Knipscheer and had a goal and an assist and Terry Virtue chipped in two helpers in the IceCats 4-3 win over the Bears in Hershey. Sergei Kharin, Paul Broten, and Chris Kenedy had the other goals for Worcester, while Jamie McLennen made 41 saves…in 1998 Lubos Bartecko and Michal Handzus each scored in the IceCats 2-2 tie against the St John Flames. Nick Naumenko assisted on both goals and Brent Johnson made 25 saves…in 2007 Josh Prudden, Lukas Kaspar, and Grant Stevenson all scored in the WorSharks 3-1 win over Providence. Craig Valette added two assists while Thomas Greiss had an assist and 25 saves…in 2009 the WorSharks scored four first period goals en route to defeating the Sound Tigers 5-3 in Bridgeport. P.J. Fenton scored two goals in the opening frame while Steven Zalewski and Matt Fornataro each had one. Andrew Desjardins had Worcester’s fifth goal. Jason Demers and T.J. Fox each had two assists and Thomas Greiss made 47 saves. The 210Sports Player of the Game is Drew Callin. 1st Period-1, Manchester, Pierog 32 (Cameranesi, Imama), 10:39. Penalties-Doherty Wor (holding), 11:14; Mercier Man (slashing), 17:35. 2nd Period-2, Manchester, Miromanov 11 (Iacopelli, Diffley), 16:17. 3, Worcester, Callin 1 (Doherty, Brauer), 18:40. Penalties-Falkovsky Man (tripping), 4:09; Falkovsky Man (tripping), 7:15; MacKinnon Wor (holding), 18:56. 3rd Period-4, Manchester, Miromanov 12 (Cameranesi, Sullivan), 15:11. 5, Manchester, Mercier 12 (Imama, Pierog), 19:37 (EN). Penalties-Sullivan Man (interference), 3:23; Doherty Wor (slashing), 6:49; Imama Man (cross-checking), 6:49; Quenneville Wor (roughing), 7:27; Mercier Man (roughing), 7:27; Imama Man (holding), 12:33; Schmalz Wor (high-sticking), 16:14. Shots on Goal-Worcester 8-9-6-23. Manchester 7-7-8-22. Power Play Opportunities-Worcester 0 / 5; Manchester 0 / 3. Goalies-Worcester, Gillam 19-14-2-3 (21 shots-18 saves). Manchester, Williams 21-12-1-2 (23 shots-22 saves).